Being obsessed with Halloween and always checking this website, we decided we wanted to make our own couples costume this year. 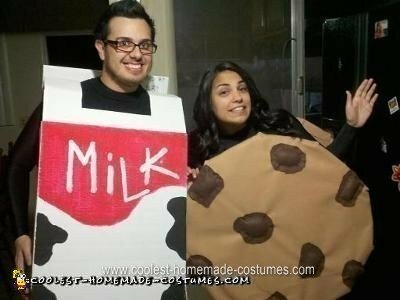 After brainstorming, we decided on the perfect classic duo homemade cookie and milk Halloween couple costume. For the design of the cookie, we decided to make a front and back cookie and attach them with straps. So we bought light and dark brown fabric and cotton, used a cardboard box for shape, and got a cheap glue gun. 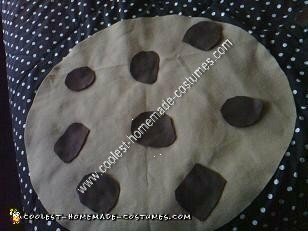 To make the shape of the cookies we cut out two large circles with cardboard, four large circles of light brown fabric and smaller circles of dark brown fabric for the chocolate chips. We than glued the chocolate chips onto the cookie leaving a small space to stuff with cotton. After we stuffed all the chips we glued them down. We did this to give the chocolate chips a more realistic effect. Then we glued two pieces of light brown fabric onto one cardboard and the other two onto the other cardboard. Our last step was to add the straps. We cut out two thin straps of fabric and glued them to the cookies. That’s how we got our chocolate chip cookie! 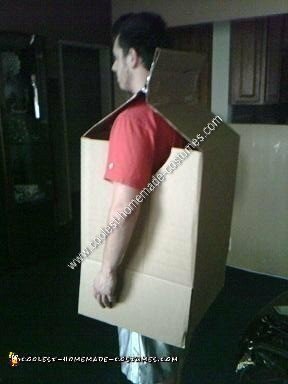 For the milk carton we bought a large cardboard box. First we cut out two of the side flaps and taped the opposite two together to make the top of the carton (pyramid shape). We next cut out arm holes and a hole on the top for the head. That’s pretty much the design of the milk carton. Next was the fun part. We painted the entire box white. Once the paint was dry we painted cow spots on the front and back. Next we painted the “MILK” logo. On one side we put the nutrition facts and on the other side for fun we put a picture of us under “MISSING”. There you have a milk carton! We wore all black underneath so our costumes would stand out. Overall the homemade cookie and milk Halloween couple costume was a big hit! We were popular with people of all ages, it was well worth the time and money! very creative!never seen this done before they came out really good! oh my lanta! that is absolutely cute idea for a couple costume. kudos to you two! love it! !